Despite their names, ShareScope and SharePad are not just all about shares. They can help you with other investments as well. In this article I’m going to tell you how you can use the information in them to invest in bonds. 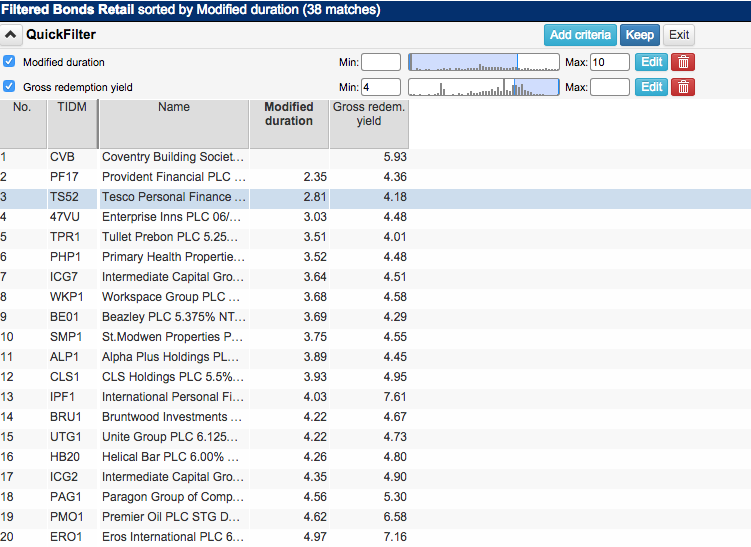 We’ve recently added some additional data for bonds into SharePad and this will go into ShareScope in due course. Bonds are IOUs. Just like shares you can buy bonds on the world’s stock exchanges. When you a buy a bond you are usually buying a slice of the borrowings of a government or a company. Instead of going to a bank to borrow money or issuing shares to investors, bonds are sold to investors as a way of raising money. By giving a company or a government some of your money you expect to receive some form of interest (like a bank account) and get your money back at some date in the future. As with most investments there is usually a trade off between the risks that you take and the returns that you get back. More risky bonds tend to offer higher rates of interest rates to compensate you for the risk that you might not get your interest paid to you or your money back. Government bonds. These are known as gilts in the UK. More often than not, the borrowings of governments have been seen as the safest bond investments which has meant that they pay the lowest rates of interest. Companies can and do go bust and so have to pay higher interest rates than governments to borrow money. The borrowings of very risky companies – those with struggling businesses and/or lots of debt – are known as junk bonds. Here the interest rates on offer tend to be very high. They may seem tempting but the risk of losing all or some of your money if the company goes bust should not be ignored. Historically bonds have been less risky investments than shares. They can be a good way of spreading your risks in a portfolio and may allow you to sleep easier at night when the stock market has one of its darker periods. They also tend to be seen as a good way to produce a safer source of income from investing than shares. So why are bonds seen as being less risky investments? A government’s bonds are seen as low risk because of its ability to raise money through taxes or to create its own money (by printing it) to pay the interest and any outstanding loans due. The borrowings of companies are less risky than its shares because bondholders get paid before shareholders who are last in the queue to get paid. The good thing about most bonds is that you have a good idea of what returns you can receive when you buy it. As the interest payments and repayment values are usually known in advance there is much more certainty in owning a bond than owning a share. It is this feature which has made them popular with investors. Unlike the return from shares where future dividends and share prices can be quite difficult to predict, the returns from bonds are more straightforward. I’ll talk a bit more about this later. Once seen as unthinkable, for governments this is now quite possible. You only have to look at the government bonds of countries such as Greece in recent times where a weak economy means that the government struggles to generate enough income from taxes to pay the interest on its bonds. Unlike the UK government, Greece and other members of the euro area are not free to print their own money to pay their debts. The same risk of not getting your money back applies to company bonds too. Companies do go bust and leave bondholders high and dry. Paying back the loan at the end of its life can be difficult sometimes as well. This is because when a company borrows it usually doesn’t set aside a pile of cash to pay the money back when it is due. Bonds are often repaid by issuing new bonds to raise the cash. But what if no-one wants to lend the company fresh money? If the company is in good health this is not usually a problem. But if the financial markets are in a state of panic – like in 2008 – it may be more difficult. The prices of bonds usually move in the opposite direction to the changes in interest rates. The simple reasoning behind this is that if interest rates were 2% and rise to 5%, because the interest paid on bonds is usually fixed, the price of them has to fall to offer investors higher interest rates. They will not stay the same as before the increase in rates as people will not want to buy investments with low rates when they can get higher ones – for the same risk – elsewhere. I’ll have more to say on this later on. The whole point of investing is to grow the buying power of your money. Inflation (rising prices) means that £5 today will not buy the same amount of goods and services as £5 in ten years time. Herein is the big problem of buying conventional bonds. As the cash flows of the bonds are fixed when it is first issued they will buy less when prices go up in the future. On the other hand, dividends paid to shareholders often go up in line with or by more than inflation if the company paying them can increase the prices for the stuff that it sells. Bond investors are usually compensated for the risk of inflation by being offered a higher interest rate. The longer the life of the bond, the bigger the inflation risk and typically the higher the required interest rate. As long as the interest rate is greater than the inflation rate, the bond holder will make money in real terms – he/she will be able to buy more with the cash. Higher inflation is therefore bad news for conventional bonds. Falling inflation or deflation (falling prices) though can make them more attractive because the cash from interest payments will buy more stuff. Investors in bonds can also try to protect themselves from inflation by buying inflation-protected (often referred to as indelinked) bonds. With these bonds, the interest payments and the capital value of the bond are adjusted in line with an inflation index (such as the retail prices index or RPI). This allows the investor to maintain the buying power of their money. These bonds tend to be issued by governments but companies such as National Grid and Severn Trent have issued some as well. 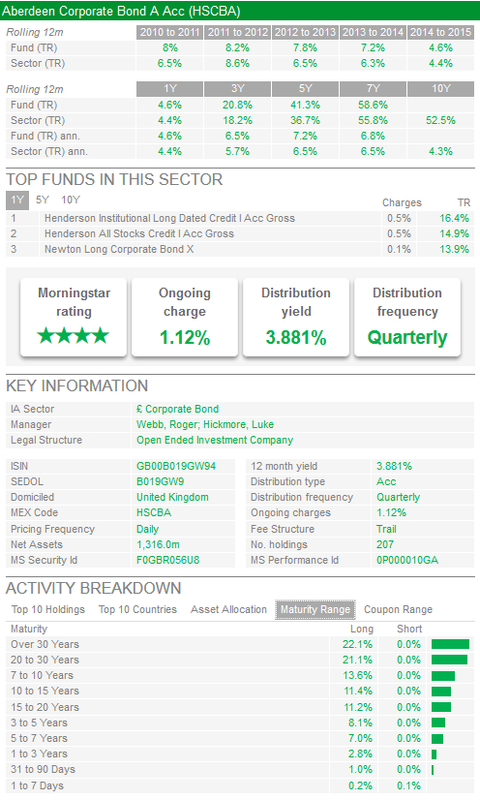 In SharePad and ShareScope you get lots of information about individual government and corporate bonds. In this section, I am going to tell you what all this information means and why it is important. Here’s a snapshot of a UK government bond which is due to mature in December 2046. Let’s go through some of the key information for this bond. This is the amount of money that the bond issuer agrees to pay back to the bondholder at the end of the bond’s life (its maturity date). Alternatively, it is sometimes called its redemption value, maturity value or face amount. Bonds are usually sold in lots of £100 or £1,000 by their issuer. This is usually their par value and what investors expect to get back when the bond matures. With the Treasury 2046 bond the par value is £100. Bonds are often priced above and below par during their lives (I’ll explain why shortly). However, the nearer the bond gets to its maturity date, the closer the price gets to its par value as this is the amount that will be paid back. This is when the par value is returned to investors. For Treasury 2046 this will be on 7th December 2046. The coupon is the rate of interest that is paid on a bond’s par value. The Treasury 2046 bond has a coupon rate of 4.25% meaning that it will pay interest of £4.25 on every £100 bond in issue. Most government bonds pay coupons twice a year. In this case the investor will receive £2.125 in June and December making up £4.25 in total. Some bonds don’t pay interest. They are known as zero coupon bonds. The investor gets a return by buying the bond at a discount to its par value (less than its par value). The difference between the discounted value and the par value at maturity is the effective interest on the bond. But instead of getting a return in the form of coupons, the investor gets a capital gain at the end of the bond’s life. Bonds have yields (an interest rate expressed as a percentage of the bond’s price) which allow them to be compared with other income producing investments such as savings accounts or the dividends received from shares. The income yield doesn’t take into account the fact that a bond will repay its par value at maturity. This is where the gross redemption yield (or yield to maturity) comes in. This yield takes into account the income received from coupons and the gain or loss on the par value when buying the bond at its current price over the remaining life of the bond. It gives a total return for an investor buying the bond today and holding it until it matures. 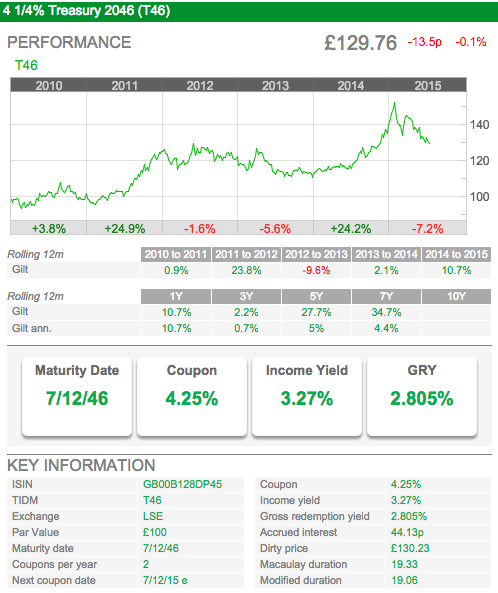 For Treasury 2046, the gross redemption yield is 2.805%. This is lower than the income yield because the investor is buying a bond today for £129.76 but will only get back a par value of £100 in 2046. The gross redemption yield takes into account this £29.76 loss. So, if we take the capital loss of £29.76 and divide that by the number of years left until the bond matures (31 years and 5 months or 31.42), we get an annual loss of £0.947. This £0.947 loss expressed as a percentage of the current price is 0.73%. So a rough approximation of the gross redemption yield is the income yield of 3.27% less the average annual capital loss of 0.73% which gives 2.54%. This is less than the quoted gross redemption yield of 2.805% which also takes into account the timing of the coupon payments and the capital loss. For those of you who know a little bit about maths, the GRY is calculated using a process known as an internal rate of return (IRR) which factors in the timing of the coupons and when the par value is repaid. I am not going to get into the maths here but suggest that you base any decisions on the quoted gross redemption yield. The dividend on a share is paid to the holder on the share register on the ex-dividend date. Bonds work slightly differently. The seller of the bond is entitled to their share of the interest for the period that they have owned the bond since the last coupon was paid. Let’s say that a bond pays £12 of interest per year split into two payments of £6 in June and £6 in December. If a bondholder sells some of their bonds at the end of March they are entitled to half of the £6 coupon due in June (they have owned the bond for three months out of 6 or half the £6 coupon period). The £3 is added to the price of the bond paid for by the buyer and is known as accrued interest. For the Treasury 2046 bond, the accrued interest is 44.13p. Bonds have two prices – a clean and a dirty one. The clean price is the quoted price that you see in SharePad. For Treasury 2046, the clean price is £129.76. The dirty price is the clean price plus accrued interest. In this case it is £130.33. The dirty price is the price paid by the buyer of the bond. The price of a bond can change for different reasons but by far the biggest reason for any price change is a change in interest rates. Bond prices move in the opposite direction to a move in interest rates. I like to think of this relationship as being similar to a see-saw – when one end is up the other end is down. Bond prices rise when interest rates fall. Bond prices fall when interest rates rise. Let’s consider a very simple example to explain why this happens. A UK government bond pays £5 of interest a year and has a current price of £100. It is giving investors an interest rate or yield of 5%. Now let’s say that interest rates across the economy go up. A bank account is now offering interest rates on savings of 6%. Why would someone pay £100 for the bond when they can get a higher rate of interest on a bank account? The price of the bond has to fall so that it can offer at least the same 6% rate of interest. In this case it would have to fall to £83.30. You can work this out by dividing the £5 annual interest from the bond by 6%. Buy if you think interest rates are going down. But different bonds with different maturities and coupons will behave in a different way to changes in interest rates. To calculate the sensitivity of a bond’s price to interest rates, we rely on two measures: Macaulay duration and Modified duration. I’m not going to get into the nitty gritty of the mathematics here but will explain what they mean and why they are probably two of the most important measures that you need to understand as a bond investor. Macaulay duration (also known simply as duration) essentially tells you how long it will take you to get your money back when you buy a bond. It is based on the weighted average of the cash flows of a bond (its coupons and par value) until maturity. Duration is influenced by the life of the bond and the size of the coupon. So low-coupon, long-life bonds will have a longer duration than high-coupon, short-life bonds because it takes a longer time for the buyer to get their money back. From the Macaulay duration we can calculate the Modified duration which is the predicted change in the price of a bond in response to a 1% change in interest rates. Remember, the longer the duration the more sensitive the bond is to a change in interest rates. The Treasury 2046 bond has a long Macaulay duration of 19.33 years. It has a Modified duration of 19.06 which means that for every 1% change in interest rate the price will be expected to change by 19.06%. That is a big price change and is a powerful illustration how lots of money can be made and lost by trading bonds. It gives rise to another simple strategy that is often used by professional investors. Buy long-duration bonds if interest rates are expected to fall. Sell long-duration bonds if interest rates are expected to rise. If bond fund managers are worried that interest rates will rise they will often try to protect the value of their portfolio by buying more shorter-duration bonds. You don’t need to worry about duration if you intend to own the bond for all of its life. Yes, the price of the bond will bounce around if interest rates change but unless the issuer of the bond defaults you will still get your coupons and your money back. It’s important to remember this if you are using bonds as a way to give you a known amount of income over a number of years – a strategy known as a bond ladder. Bond laddering avoids some of the risks of locking into a lower interest-paying bond investment if interest rates rise and bond prices fall. It is a possible strategy for people looking for alternatives to annuities when trying to produce an income from their pension pot. I’ll be telling you more about bond laddering in the next few weeks. You can use SharePad to filter for bonds just as easily as you can for shares. Here’s one that looks for retail bonds (company bonds that individual investors can buy through their broker) with a gross redemption yield of more than 4% and a maximum Modified duration of 10. This might be a strategy used by a more risk-averse bond investor. SharePad has found 39 shares that meet these criteria. Here’s what it says about the Tesco Personal Finance bond. We can see that the bond matures in just over three years’ time in August 2018. Buying the bond at its current price will give an income yield of over 5% and a gross redemption yield of 4.18% – which factors in that you are paying £103 today but will only get back £100 in 2018. You could compare this bond with Tesco shares which currently pay no dividend. The bond might look a better short-term investment than the shares as they have a higher income and stand less chance of big losses even if interest rates rise (due to its very low duration). High yields can be very tempting but they also usually come with higher risk. When it comes to bonds a high income yield may be offset by a big capital loss and low gross redemption yield. Also a bond may have a high yield because the company behind it is very risky. Here you can see that there are a number of bonds with high income yields but low gross redemption yields because they are close to the end of their lives. Sometimes you can find bonds with high income and gross redemption yields. This can be a sign of a potential bargain but can also mean that the bonds are very risky. 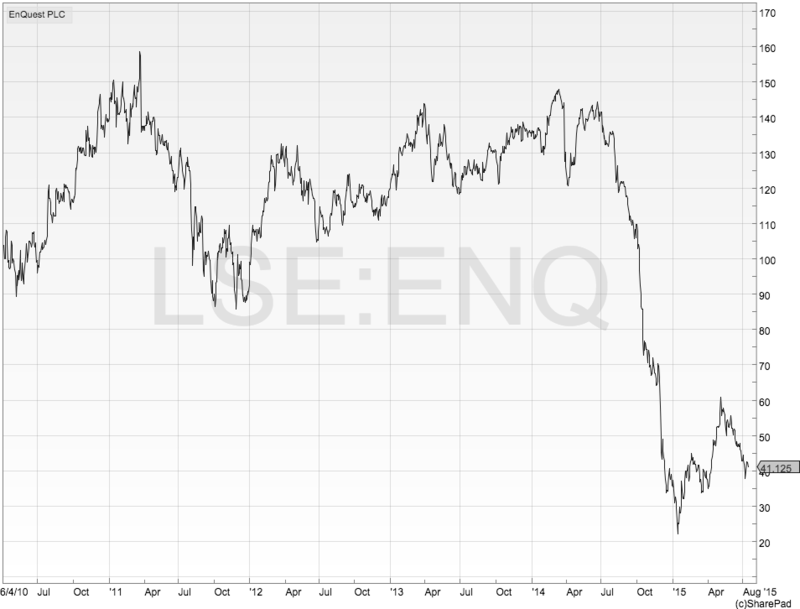 Let’s take EnQuest 5.50% bonds that mature in 2022 as an example. These bonds are trading a long way below their par value of £100. 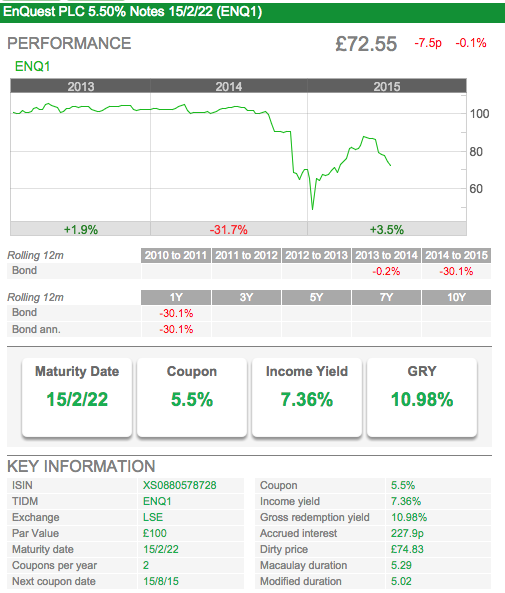 By looking in SharePad you can see that the bond price collapsed in 2014. You need to find out why this happened before you can even begin to think that the high yield is not a trap for the unwary. The first thing you could do is to look in SharePad to see if EnQuest has listed shares as well as bonds as a company with shares will provide detailed financial information to investors. You can quickly find out that it does and that it is an oil exploration company which makes it a risky business. Its share price has been hammered as oil prices have fallen. It has a lot of debt and has asked bondholders to allow it to have higher levels of debt for a while so it doesn’t default on the bonds. In return the coupon on the bonds will increase from 5.5% to 7%. This shows that these bonds are probably very high risk and not for those who like to sleep well at night. They might though be the type of investment that interest adventurous investors. As with shares, you should always do your own research before investing in bonds. 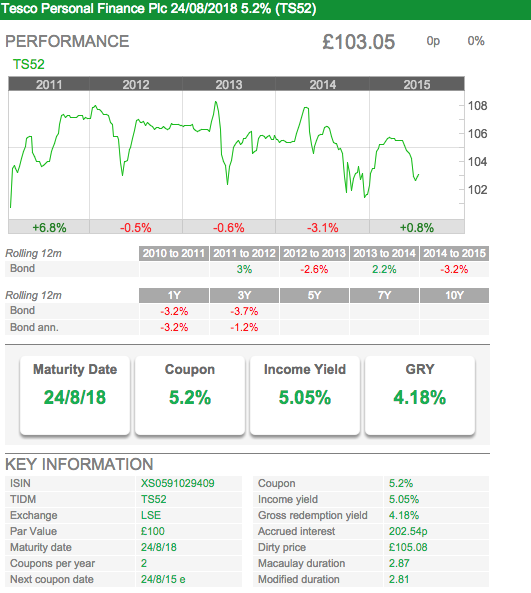 SharePad tells you how a bond fund has performed in the past. At the same time it will also tell you the best performing funds in a particular bond sector so that you can compare them. You will also get information on how much the fund manager charges you to invest (the ongoing charge), how much income the fund pays out (the distribution yield) and how often (the distribution frequency). It is also very easy to scrutinise where the portfolio is invested by looking at the top ten holdings. One particularly useful feature for bond funds is the maturity range. Remember the link between interest rates and bond prices. You can see if the bond fund has more long-term or short-term bonds in its portfolio. If a fund is stuffed full of long maturity bonds – with remaining lives of 10 years or more – you might not buy it if you thought there was a strong chance of interest rates going up.